Vintage jeans are clearly having a moment. Based off Instagram, it seems like everyone and their mother has found their perfect pair of vintage 501s or authentically distressed Lees. But if you have yet to find a pair that suits your shape and style, we're here to help, as we know from personal experience that it can be quite the challenge. When it comes to denim (both vintage and current), it's hard to think of a style more iconic than Levi's 501s. They're one of the most universally flattering vintage pairs on the market thanks to their sky-high rise and tapered legs. And their ability to look just as good with a simple sweater and sneakers as they do with a cami and statement heels make them a firm fashion girl-favorite. Finding your perfect pair of 501s is all about trying on as many pairs as possible. The cut has changed slightly over the years, as has Levi's sizing scale, so going by the number on the waistband likely won't work, making going into IRL brick-and-mortar stores the best way to find a pair that fit. The rough-and-tumble cowboy fit of vintage Wrangler jeans make them a dream for those of us looking to create curves where they aren't naturally there. The straight up-and-down shape of this type of vintage jeans means that they'll accentuate your hips, and the classic "W" stitching on the back pockets is seriously flattering. When it comes to picking a pair up, trying them on in person is key here again—especially since Wrangler doesn't have a single iconic style like the 501s that you can search for online (like with Levi's eBay and Etsy can be online treasure troves if you're willing to dig). As for Wranglers you can buy from retailers, Free People and Urban Outfitters have a top-notch selection of reworked vintage and vintage-inspired Wrangler styles. Like Wrangler, Lee's Western history runs deep—the jeans were originally manufactured for cowboys. And while they still give off rodeo vibes, their fit is a bit more forgiving through the hips, making them ideal for curvier girls. It's also worth noting that Lees tend to run long, making them ideal for accentuating model-length legs, though short girls can take some fabric scissors to the hems to create a cool kick-flare crop. As with all of the other styles on this list, we'd recommend hunting down a pair of vintage Lees IRL so you can give them a try before you buy. And because the brand uses such heavy denim to make their jeans, you should be able to find a wide variety of fits spanning multiple decades—including '70s flares and '80s mom jeans. Though Levi's, Wranglers, and Lees are the most common denim brands you'll come across on your thrifting expeditions, aren't the only options worth looking out for. Less-common classics include Calvin Kleins—which of course nail that '90s grunge look (think ultra-high waists, booty-loving pockets, and tapered legs)—and Jordache's curve-hugging take on iconic '80s and '90s silhouettes. If you're specifically looking to pick up a pair from either of these brands, we'd suggest sites like eBay and Etsy, which will have a more targeted selection than your local flea market. 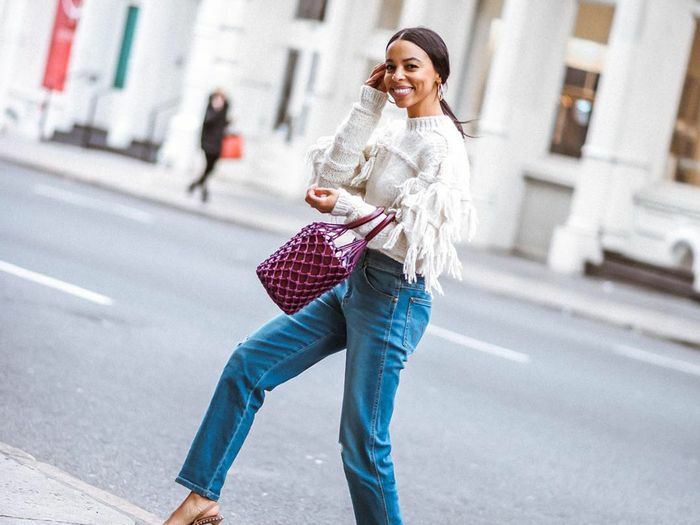 And if you still can't find your perfect pair of vintage jeans, the vintage-inspired styles below should all do the same styling trick. Next, discover the fashion editor–approved places to shop for vintage on Instagram.